Members of the Wahama baseball team pose for a picture after capturing the 2015 Class A championship Saturday with a 7-0 victory over Man at Appalachian Power Park in Charleston, W.Va.
Wahama head baseball coach Tom Cullen, middle, is joined by assistant coaches Phil Hoffman, left, and Ron Bradley, right, for a picture with the 2015 Class A championship trophy after Saturday’s 7-0 victory over Man at Appalachian Power Park in Charleston, W.Va.
Wahama junior Ricky Kearns belts out an RBI-single during the fifth inning of Saturday’s 7-0 victory over Man in the Class A championship game at Appalachian Power Park in Charleston, W.Va.
Wahama senior Kris Clark, top left, catches some air before joining the infield celebration moments after the White Falcons’ 7-0 victory over Man in the 2015 Class A state championship game at Appalachian Power Park in Charleston, W.Va.
Members of the Wahama baseball team break a team huddle before the bottom of the seventh inning during Saturday’s 7-0 victory over Man in the Class A final at Appalachian Power Park in Charleston, W.Va.
Wahama senior relief pitcher Garrett Miller reacts with the White Falcon faithful after the final out of Saturday’s 7-0 victory over Man in the Class A championship game at Appalachian Power Park in Charleston, W.Va.
CHARLESTON, W.Va. — Wahama had a successful postseason formula. Hang on until the flood gates open, then simply spread those wings and fly. The White Falcons capped their 2015 WVSSAC baseball tournament run in impressive fashion Saturday afternoon during a 7-0 victory over defending champion Man in the Class A state final at Appalachian Power Park in the Mountain State capital city. Wahama (25-7) had a common blueprint en route to the program’s third state championship in baseball, a plan that most baseball aficionados know by heart — pitch well, play solid defense, be patient at the plate and everyone contributes. Scoreless through four complete, the visiting White Falcons finally broke through in the top of the fifth when nine-hole hitter Jared Nutter provided a one-out double down the right field line. Leadoff hitter Ricky Kearns followed with an RBI-single to center for a 1-0 advantage. The Hillbillies (19-15) had the wheels fall off the wagon in the top of the sixth, as a one-out fly ball to left field was dropped — allowing the guests a golden opportunity. MHS followed by getting another pop up for the second out in the frame, but Wahama answered by reeling off six consecutive hits for six runs and a comfortable 7-0 cushion. From there, Wahama’s defense escaped a bases-loaded jam in the bottom of the sixth and left runners stranded at the corners in the seventh. WHS reliever Garrett Miller fanned Man standout Braden Griffin — a West Virginia State signee — for the final out, and a quick throw to first on the dropped third strike started the White Falcon celebration. The historical win capped a remarkable 7-0 postseason run, one that saw the White Falcons outscore and outhit their opponents by overall margins of 72-7 and 76-24, respectively. The six-run outburst in the top of the sixth was also the 13th time in 43 innings that WHS plated at least three runs during the postseason trek. Wahama also posted five shutouts in those seven Class A tournament games and committed only four errors during that span, compared to 20 miscues by the opposition. The Red and White also never allowed more than two runs in any of those 43 tournament innings played. After 11-plus seasons as Wahama skipper, not to mention being involved in a coaching capacity with the WHS program for 35 years, Tom Cullen was smiling ear-to-ear as his troops joined the 1996 and 1998 squads in bringing home a state championship. Nonetheless, ending the White Falcons’ 17-year absence at the state tournament and coming away with the big prize still left the venerable mentor looking to the future. Obviously, the six-run sixth played a significant role in the final outcome. Cullen, however, noted that it wasn’t any kind of extra effort, but rather an execution of fundamental baseball. “That was big for us, knocking out six straight hits there with two outs,” Cullen said. “We didn’t try to kill it, we just put the bat on the ball. Sometimes, that’s all it takes. Following the two-base error that allowed Mason Hicks to reach safely, Demitrius Serevicz popped out to center for the second out of the sixth. Josh Petry then entered as a courtesy runner for Hicks, and Jared Oliver singled Petry home for a 2-0 lead. Ryan Thomas followed with a single that put runners at first and second, then Man pulled starter Jake Adkins in favor of John Thomas Keffer. Keffer’s first test came in the form of Nutter, who delivered an RBI-single to left that plated Oliver for a 3-0 edge. Thomas and Nutter both moved up a base on the unsuccessful throw home to get Oliver, then Kearns answered with a double to left-center that allowed both Thomas and Nutter to score for a 5-0 cushion. Kaileb Sheets singled to left and both runners advanced up a base after the ball was misplayed, then a passed ball allowed Kearns to cross the plate for a 6-0 lead. Philip Hoffman then poked a double out to right field that allowed Sheets to score, wrapping up the seven-run outcome. Wahama outhit the hosts by a sizable 12-4 overall margin and committed only one of the four errors in the contest, the White Falcons’ first postseason miscue since clinching the Region 4, Section 3 title with a 15-0 victory over Calhoun County at J.C. Cook Field. WHS — which won both regional and state games as the guests on the scoreboard — stranded just six runners on base, compared to nine left on by the Hillbillies. Hicks was the winning pitcher of record after allowing three hits and six walks over six-plus innings of work while striking out eight of 26 batters. Miller also struck out two and surrendered a hit while facing four batters in one inning of relief. Adkins suffered the setback after allowing four earned runs, eight hits and a walk over 5.2 frames while fanning three of 23 batters. Keffer also surrendered three earned runs and four hits over 1.1 innings of relief while striking out one of the eight hitters he faced. Man — which won the 2014 Class A crown with a 12-10 decision over Notre Dame — had other opportunities to score besides its final two plate appearances, but Wahama’s defense and pitching came through in each of those early situations. Hicks — who held MHS hitless through three innings — issued a pair of two-out walks in the bottom of the third, but two-hole hitter Bailey Beckwith grounded into a force out to end that threat. Man also had runners at second and third with one out in the fourth, but a pop up to second and a strikeout kept the game scoreless headed into the fifth. Kearns led Wahama with three hits and three RBIs, followed by Miller and Nutter with two safeties apiece. Sheets, Hoffman, Hicks, Oliver and Thomas also had a hit each in the championship triumph. Hoffman, Oliver and Nutter each drove in a run for WHS, while Nutter led the guests with two runs scored. Kearns, Sheets, Petry, Oliver and Thomas also scored once apiece for the victors. Griffin paced Man with two hits, while Beckwith and Mike Scott Rowe had the other safeties in the setback. The Hillbillies one, four and last four hitters in the lineup went a combined 0-for-14 and received five walks in 19 plate appearances. Wahama has now won six straight Class A state tournament games and owns an alltime mark of 8-3 in the WVSSAC Final Four. WHS previously defeated Van (3-2) in 1996 and Moorefield (9-4) in 1998, the other two White Falcon championship campaigns. Wahama’s 7-0 win was also the first shutout in a Class A final since Buffalo blanked East Hardy 10-0 back in 2006. The Red and White also appeared in the 1969, 1978 and 1998 state tournaments. It was the final baseball game for seniors Demitrius Serevicz, Garrett Miller and Kristopher Clark in Wahama uniforms. The White Falcons’ remaining 2015 roster included juniors Jared Nutter, Kaileb Sheets, Ian Hook, Mason Hicks, Ryan Thomas and Ricky Kearns; sophomores Philip Hoffman, Kaleb Gibbs, Nyles Riggs, Josh Petry and Jared Oliver; and freshmen Colton Arrington, Cass Kimes and Dalton Kearns. Joining Tom Cullen on the WHS coaching staff this season were assistants Ron Bradley and Phil Hoffman. Marcia Ortiz and Gary Clark also served as statisticians for the program. The White Falcons defeated Hannan (17-0), Calhoun County (10-0), Calhoun County (15-0), Charleston Catholic (6-4), Williamstown (11-0) and Bishop Donahue (6-3) en route to the Class A state final. Jefferson won the Class AAA title by defeating Nitro by a 2-1 count in the first championship game Saturday, then Bridgeport repeated as Class AA champs by posting a 5-0 shutout over Chapmanville. 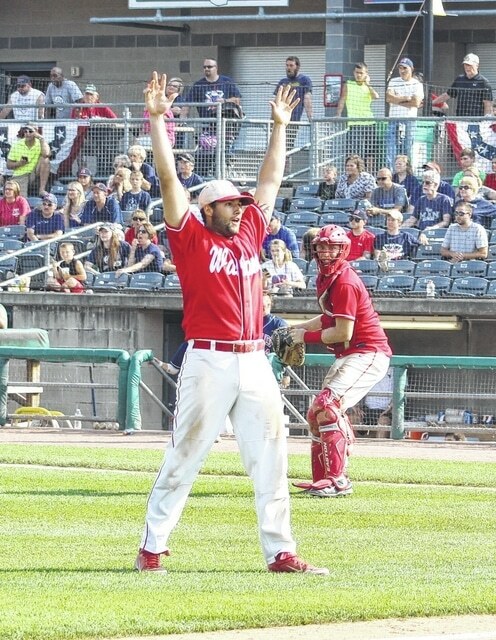 Wahama’s win concluded the 2015 postseason in West Virginia.